Last week I was alerted by a message Bev of Burning Silo sent to the Eastern Ontario Naturelist to look for the Brilliant Jumping Spider (Phidippus clarus) on milkweed. (Here's a link to one of her photos of this spider, click next at the site to get another view)I went to look and almost immediately found one. My success at finding these guys is running about one in ten milkweeds, and better than that in some patches. These are quite beautiful spiders, as jumping spiders are, and big enough that you can spot them from a few feet away. I've been trying to get a photo of one, but they are quick and wary. I haven't yet been successful. When I was scouting around some milkweed today I found, on three plants in one small area (and one on a lawn chair), another jumping spider. Very plain, brown (cryptic) with a quite bright white mask over the eyes. I've been doing some searching around, and the best guess I have so far is that this is a member of the genus Ghelna, the only trouble being that this is a genus of ground-dwellers, which means both that one wouldn't expect to find them living up in the milkweeds, and that there aren't as many pictures of them as there are of other jumpers. So, I don't really know, and the picture isn't great (these too are wary and quick). The spider is about the same size as the Brilliant jumper, but very plain except for the mask, and give the impression of dark brown or dark grey and fuzzier than the Brilliant. This one was in a little folded leaf shelter--the others I saw were free-ranging on the leaves of the plants. Pamela - thanks for sending this post along for Circus of the Spineless. 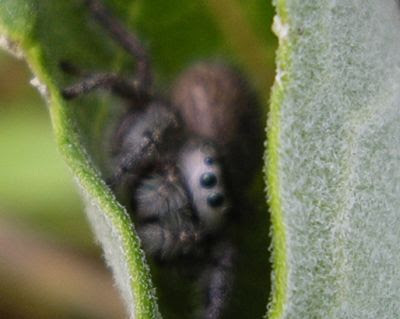 Maybe one of the readers will be able to offer an ID for the mystery jumping spider! I am trying to breed and maintain my jumping spiders in my back yard by capturing them.I observe them and study the mating and hunting process, and advise for my capturing and breeding. What can I do about a bite from a Jumping Spider? I was bit 22 years ago, and the infection keeps coming back. Red streaks from the blisters up into my arm and ear. My forearm swells and gets really hot. What can I do? My sister will be scared to death if she sees about jumping spiders, she is terrified by any spider and she has no idea this kind of spiders exist, maybe I should tell her haha!